Les Grands Montets rises above the village of Argentiere near Chamonix in the French Alps. With exceptional vertical drops and tough terrain, about half the runs are black. I dropped the boys at school and in about an hour was in Argentiere. After another hour (mainly waiting in queues) and two telecabine rides I was on top of Grand Montets at 3300 m, with a spectacular view of Mont Blanc and clear blue skies. Chamonix is visible in the valley below. The photo below gives a closer view of Mont Blanc – at 4810 m the main summit is 1.5 km (or nearly a mile) higher than where I am standing. 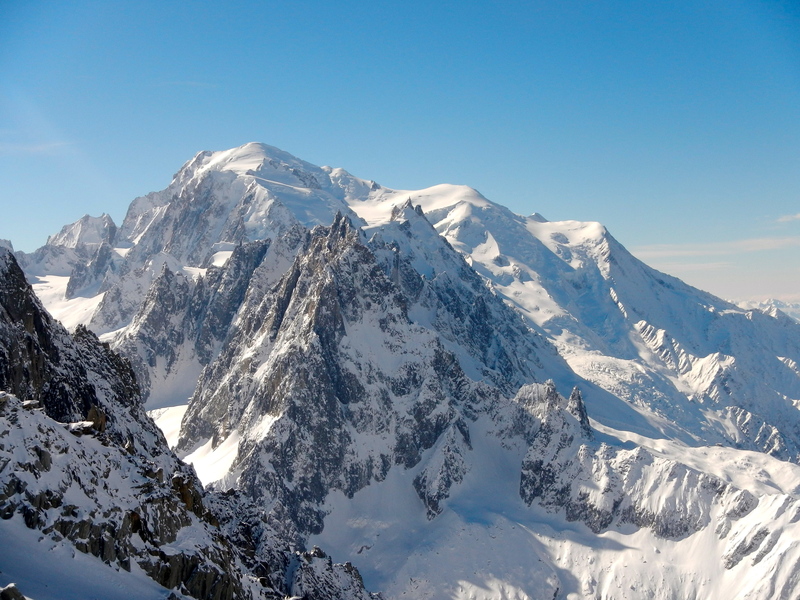 The tower on the Aiguille du Midi is just visible in front of the main summit. Behind it is the Gouter Ridge and the Dome du Gouter – the route by which I climbed Mont Blanc in 2010. 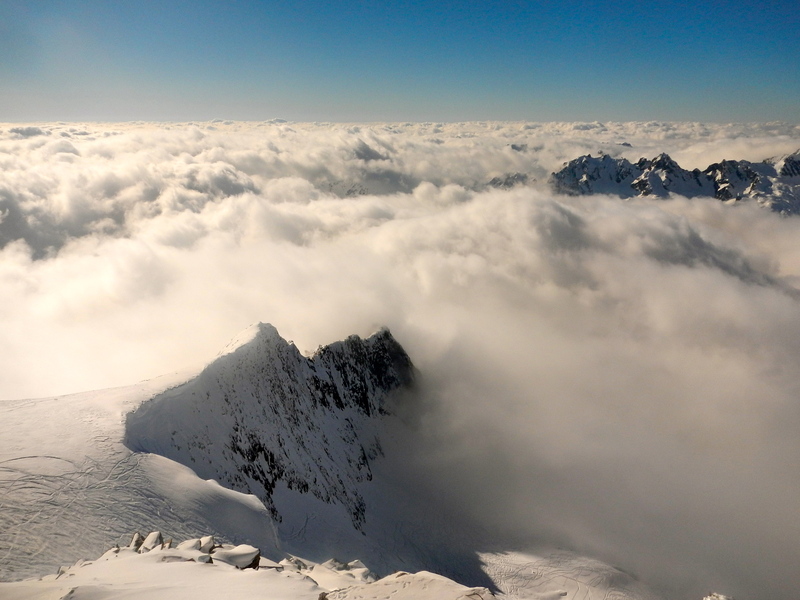 Skiing from the top of the Grands Montets (3300m) is a skiers dream. With a 2000 m vertical drop to Argentière, and good powder, who needs heli-skiing. 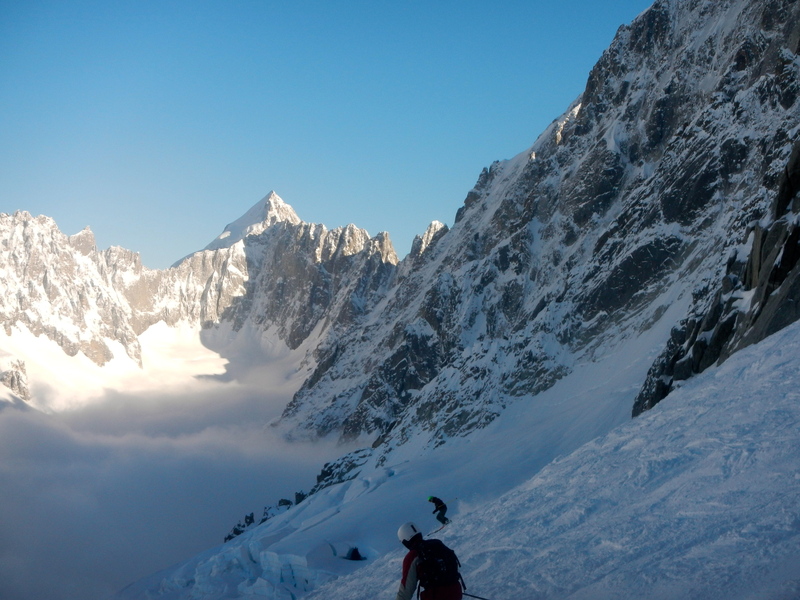 The route off Aiguille des Grand Montets is a very steep off-piste black route on a glacier. 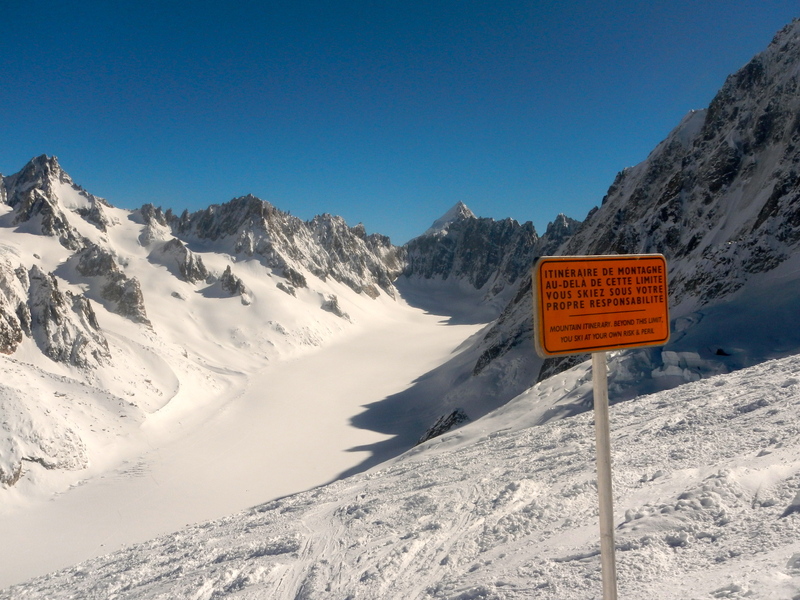 Behind the sign is the Glacier des Rognons and below it the Glacier d’Argentiere. 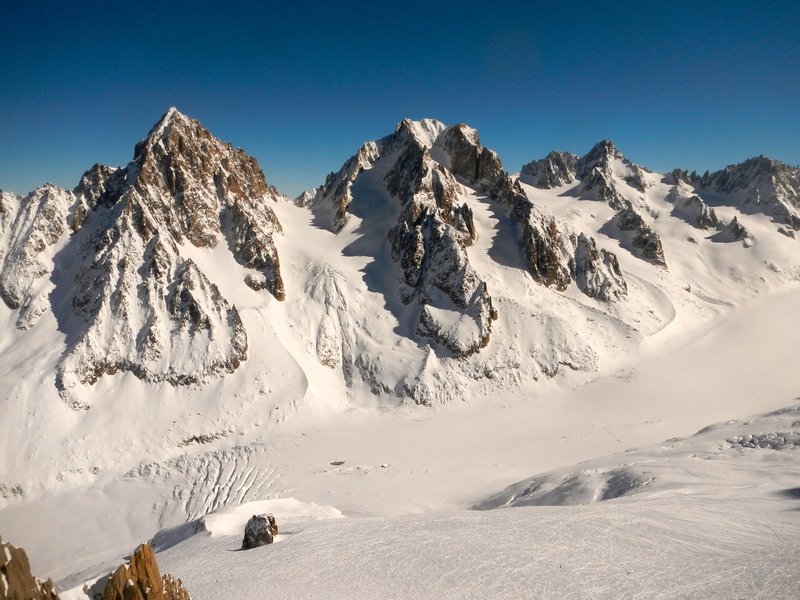 Glacier des Rognons and Glacier d’Argentiere. Dropping down a bit further gives a good view of the Argentiere Glacier with the Aiguille d’Argentiere behind. Seracs and crevasses on the glacier can be clearly seen. I was sticking to a main route, but people venturing out onto the glacier should be wearing a harness and carrying ice climbing gear. Last time I skied this route, I saw someone ski into one of the crevasses. Fortunately he had some friends with gear to get him out. The full route from the top down to the Argentiere village, which I skied, involves a little over 2000 metres vertical drop (or close to 7000 feet). It is supposed to be the longest vertical drop in the world for a ski route accessible by lift (rather than helicopter). 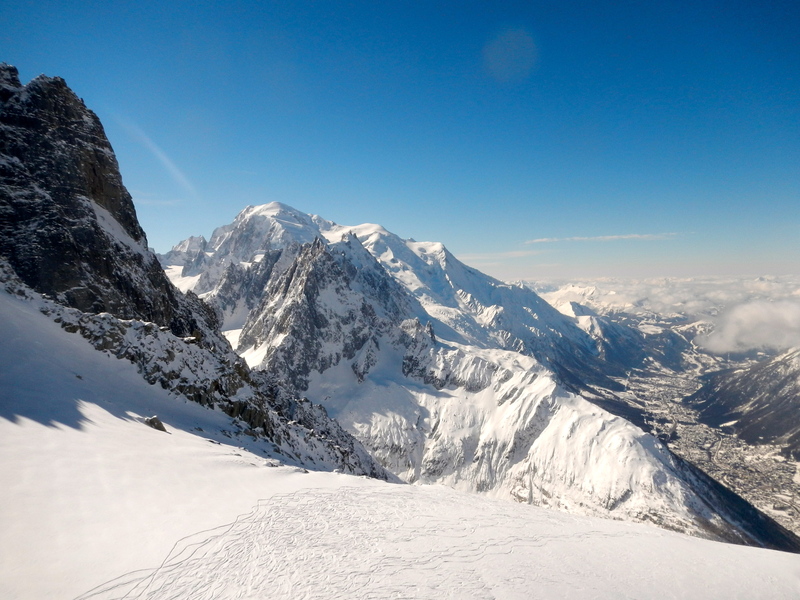 I checked and the Vallee Blanche route from Aiguille du Midi is a slightly shorter drop if you stop at Montenvers as I did, but longer if the snow is good enough to continue down to Chamonix. 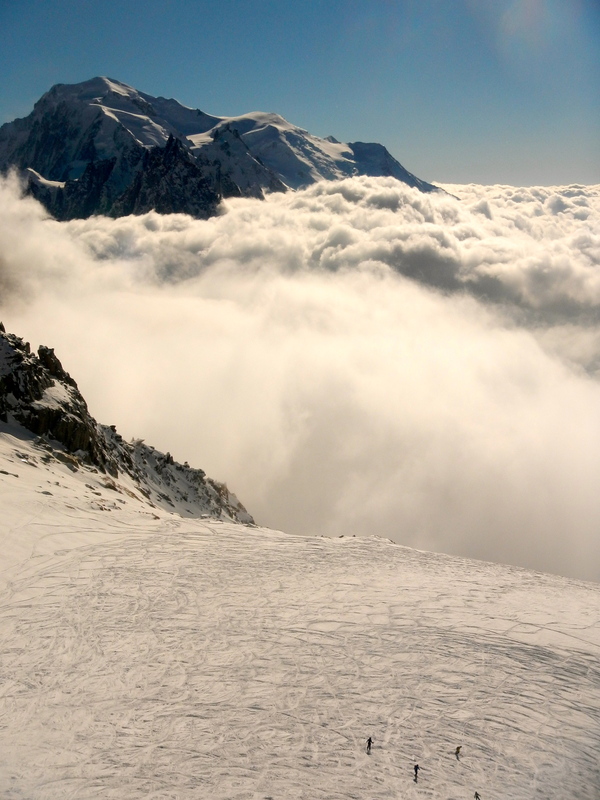 I went back up to the top after lunch and the clouds were coming in – below Mont Blanc. Towards the bottom of the photo below, some skiers can be seen, heading off the other side from where I was going. 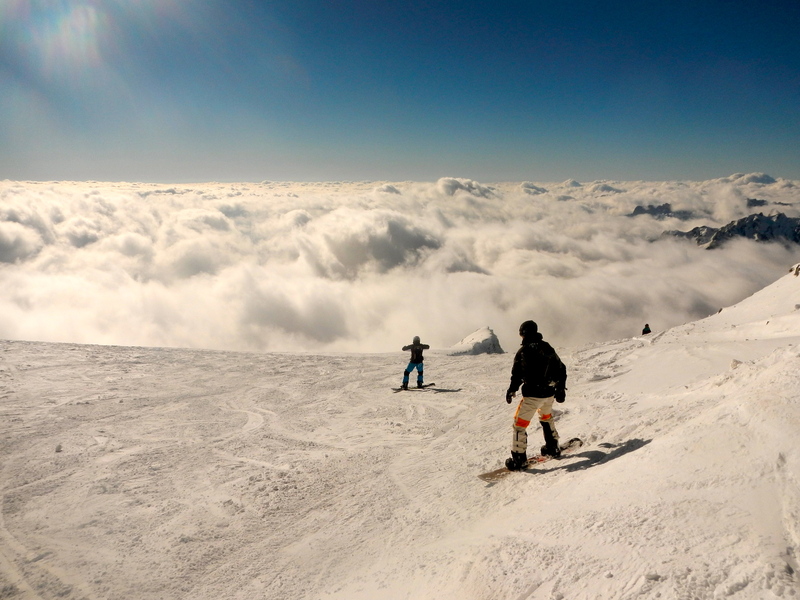 I could not resist taking a photo of snowboarders heading down into the clouds. I headed down the Glacier des Rognons for the second time. My legs were absolutely protesting by this stage, too much difficult and steep off-piste skiing for one day. But I skied down to the car. Could barely walk afterwards, with over 6000 m vertical (or 20,000 feet) skiing in one day. This entry was posted in Mountains, Photography and tagged Alps, Argentiere, France, Les Grands Montets, Mont Blanc, skiing by colinmathers. Bookmark the permalink.